Adaptris Interlok is an event-based framework designed to enable architects to rapidly connect different applications, communications standards and data standards to deliver an integrated solution. The key design philosophy of the Interlok framework is the ability to apply the right amount of integration technology in the appropriate place. It offers complete flexibility to embed custom application connections and services within the framework. You can either compose services into your integration solution; or you can write custom code. Sometimes custom code is better, sometimes it isn’t. An Interlok container contains one or more Adapter instances (for now, we can treat them as having a one-to-one relationship, so Adapter/Interlok may be used interchangeably). An Adapter is made up of one or more channels, each of which has two optional connections of arbitrary types, for producing and consuming messages. Each channel has one or more workflows, each of those will have a consumer and a producer and a collection of services which interact with the message. Consumers read data and create a message with that data as its payload. A message is generally made up of a payload and metadata. Producers produce that data somewhere. Services act upon the message and do things to it (like transformations, validation, encryption, content enrichment; all the usual EIP that you might find). The simplest Adapter will contain a single channel with a single workflow. There is an empty service-list configured; so no services are applied. The standard camel case java naming convention is converted to use a - in XML element names, so uniqueId becomes <unique-id>; all string and primitive types are expressed as elements in XML and conversion is handled automatically. In cases where the property being set is an interface or abstract type, it is necessary to supply the runtime type of the implementation to use; which is where the class= attribute comes in (you can see this in the example above). All standard classes are annotated with an alias which gives you a friendly name to use rather than the fully qualified class name. You can still use the fully qualified classname if you wish; but package/class names do change from time to time so using the friendly name is preferred. In the example above fs-consumer is the friendly name for the class com.adaptris.core.fs.FsConsumer. An AdaptrisConnection object tends to wrap any behaviour that is required to setup a persistent connection an application; such as making a connection over a socket, or making a connection to a JMS Provider or Database. Some AdaptrisConnection instances may not make a connection but instead encapusulate common configuration options that can be overriden. A workflow is a container for a consumer, a producer and a collection of services which will interact with the message. Various types of workflow are available, and each will have slightly different behaviour. The ones that you’re likely to use are standard-workflow, pooling-workflow and jms-transacted-workflow. An AdaptrisMessageProducer is responsible for sending the message to the target system (that may already have been connected to by an AdaptrisConnection). Typical types of producer are FTP, Email, HTTP, JMS, along with many more available in the optional directory. An AdaptrisMessageConsumer is responsible for receiving messages from the target system. You need to decide on how the consumer will be triggered. Some consumers such as FTP or Email are timer based (i.e. they poll on a schedule); some like JMS are passive and notified about incoming messages. Services are a means of applying arbitrary functionality to messages and as such are the key low-level building block in Interlok. Examples of services included encrypting message payloads, applying XSLT transformations and extracting metadata using XPath or regular expressions. It is straightforward to create custom services if no existing off the shelf service meets a particular requirement (see Custom Services). Services are often grouped into collections. Simple collections allow a linear list of services to be applied one after the other. More complex collections allow services to be applied conditionally based on configurable criteria, allowing complex processes to be modelled. How then can we find what connections/producers/consumers/services there are and understand the configuration they require? The definitive source of information describing how to configure any component are available is the Javadoc documentation in docs/api available as part of your installation. You can also find them online : https://development.adaptris.net/javadocs/. Tip: Look at the javadocs for the class in question; any public setter/getter combination means you can configure it in XML e.g. getUniqueId() + setUniqueId() means that you can configure a <unique-id>myUniqueId</unique-id>. Secondly, examples of all standard components are included in directory docs/example-xml. If you look in this directory find the one called com.adaptris.core.ServiceList.xml which contains example configuration for a service-list. 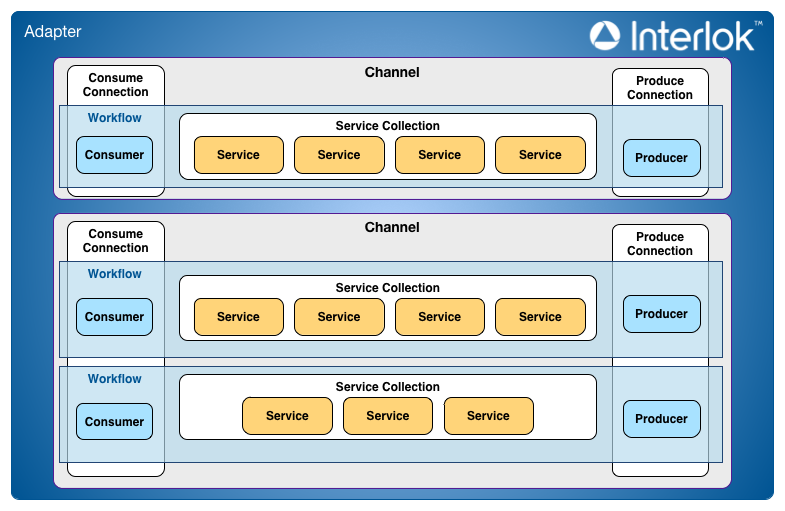 A service-list is just a container for one or more services. By convention a NullService is shown as a placeholder where any service may be configured. Your example may not be exactly the same; it is likely to have unique-id elements. These are generated by default to allow referencing by the UI; they are not strictly required, and will be re-created with a new unique-id if you do not configure one.